While Phoenix is acknowledged as one of the fastest growing metropolitan areas in the U.S., still very few riders know about the splendid rides in the vicinity of Arizona’s capital. One of the great features that Phoenix has to offer motorcyclists is the comfort and variety of a vibrant urban area in combination with easy access to magnificent rides with unexpected diversity. Through 6,000 ft. of elevation change, Central Arizona’s roads wind amidst lonely cacti and pine forests, introducing the rider to landscapes from sweeping southwestern vistas to steep canyon walls. The first two of the five best day-rides mentioned here are suitable for cruiser, touring, or sport bikes; the last three require a motorcycle which can be safely ridden on dirt roads as well. 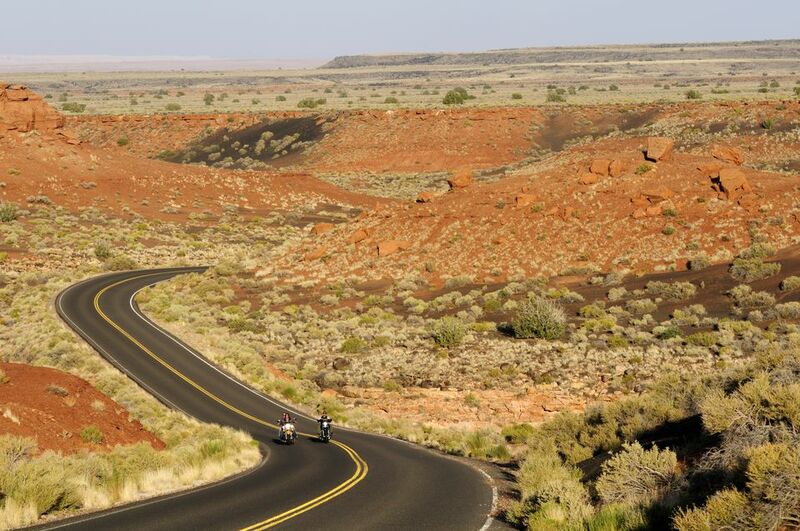 The potpourri of spirited rides on the tarmac and the captivating beauty and solitude of unpaved back roads overlaid with a bit of old western touch is what we call the “Arizona Motorcycle Experience.” Take part in it! This 145-mile ride provides a nice blend of culture, suburban and natural beauty, topped with a hint of old western flavor. A short warm-up ride takes you to Taliesin West, one of Frank Lloyd Wright’s masterpieces where you can choose from one to three-hour tours, according to your pace and interest. Passing the scenic location of the famous Mayo Clinic you start to climb to Fountain Hills, one of the newest modern desert colonies in Arizona. As you go uphill, stay in the right lane and watch for the scenic turnout, which gives you an aerial view of the East Valley. The Fountain Hills community proudly presents one of the tallest fountains in the world. Heading further north, take a loop around McDowell Mountain Park and perhaps stop for a short hike. You can learn more about the park by spending a couple of minutes at the visitor center. The next stop is a popular summer weekend escape for Phoenicians—Bartlett Lake. At the marina, you’ll have a better understanding about the debate over whether or not Arizona has more boats per capita than any other state! As you climb up the road from the marina, take the right turn and visit the beaches that give different views of the lake. On summer weekends be prepared that you won’t be the only visitor. Backtrack on Bartlett Dam and Cave Creek roads and enjoy the shops and restaurants embedded in the laid-back ambiance of the Carefree-Cave Creek area. By the end of this ride it will probably be dark as you head back to Scottsdale or Phoenix, so watch for the broad vista of sparkling city lights on your left as you turn onto Happy Valley Road. You can get a taste of the history and the twisty tarmacs of Arizona through this 274-mile day ride. For the more ambitious riders, there is an extended version, which stretches over 330 miles. The destination, the City of Prescott, lies at 5,400 feet, so be prepared for curvy roads and significant temperature change. During the summer this ride provides a great escape from the high valley temperatures, while during the winter, this route might remind you of those chilly northern rides. Wickenburg fills an illustrious chapter in the history of Arizona and the West. Though only 54 miles away from the hustle and bustle of modern Phoenix, Arizona's most western community hearkens back to a different time and place. Don’t miss stopping at the Desert Caballeros Western Museum. If you want to stretch your legs, pick up a self-guided ‘Historical Walking Tour’ brochure at the Wickenburg Chamber of Commerce, right behind the old railway station, and take a walk. An additional 42-mile side trip has you visiting the world’s largest collection of antique mining equipment at Robson's Arizona Mining World. Climbing Yarnell Hill will be a feast for riders and bikes alike, but please don’t let the racing spirit overtake your command of the broad sweepers. Some of them are off-camber and you’ll also encounter a few decreasing radius turns. Arriving at the top of the hill you can reward yourselves at the Buford's Buzzard's Roost Café, a popular biker stop in Yarnell. The Sharlot Hall Museum in Prescott is a must if you are more interested in the history of the region, while The Palace on the Whiskey Row gives you an instant feel of the Old West as the patrons saw it through the window of the saloons. The shorter ride is to backtrack on the same road, but don’t worry about getting bored, descending from Prescott provides a completely different view. You’d hardly recognize that you are riding on the same road. The extended ride takes a loop around northwestern Prescott and reconnects Hwy 93, aka Joshua Forest Parkway, forty-three miles northeast of Wickenburg. The ride is winding and scenic but facilities are scarce. Make sure that you fill up in Prescott. Virgil Earp was a resident of Kirkland from 1898 through 1902. If you wonder what life was like in this area, check out the former Kirkland Store and Hotel, now known as the Kirkland Bar and Steakhouse. As the legend goes, the face of a murdered lady of pleasure resurfaced on a wall in the building. If you have good eyes you’ll find it yourselves. Look around the back of the restaurant! The 256-mile loop incorporates a forty-three mile maintained forest road ride and rewards riders and passengers with magnificent views from the edge of the Colorado Plateau. The first 100-mile ride on the pavement lifts you almost five thousand feet, to the top of the Mogollon (pronounced muggy-yon) Rim. Dropping as much as 2,000 feet in some areas, the Rim provides some of the most far-reaching scenery in Arizona. The vast acreage covered by tall pines is part of the largest ponderosa pine forest on the continent. Surprise, surprise, this too is Arizona! Entering the city limit of Rye, on Hwy 87 watch for the huge Motorcycle Salvage Yard on your right. If you are interested in stories of frontier living, pay tribute to Zane Gray, the father of the western novel by visiting his recently restored cabin in Payson. Just a few miles north of Payson the Tonto Natural Bridge invites you for a scenic hike. If you happen to visit Strawberry on a weekend between mid-May and mid-October, you can peak in the oldest standing schoolhouse in Arizona, which was established in 1884. Just ten miles from Strawberry you’ll leave the pavement and turn onto the Rim Road, one of the finest backcountry roads in the Phoenix vicinity. In addition to the enthralling vistas, the road also follows another feature of interest, the General Crook Trail, which the famous Indian fighter blazed to his stronghold at Fort Apache. If you look carefully, you still can see remains of the old wagon road snaking its way beside the top of the cliffs. The highest elevation of this trip, the Promontory Lookout at 7,900 feet, also defines the best season for this ride. Unless you want to try snow riding, schedule your trip to the Rim Country between May and early October. At Mountain Meadow, you’ll reconnect with the pavement. Take a break at Kohl’s Ranch where you can savor a Payson Cheese Steak or a Canyon Creek Sandwich in the Zane Grey Steakhouse & Saloon. You’ll continue your trip east towards Payson and then descend to the Valley of the Sun. During the summer drought, occasional forest road closures do happen. Check out the conditions with the National Forest Service before you head out. Note: Before you plan a ride on unpaved roads, make sure that your bike is equipped for such a ride and the bikers are prepared with the appropriate motorcycle riding skills. This 223-mile adventure ride features spectacular scenery to rival any in the state. The twenty-mile graded dirt section of the trail provides magnificent views of twisted igneous mountains with dense forests of saguaro and Ferocactus with several deep blue lakes along the way. Fish Creek Canyon is perhaps the most awe-inspiring section. The road hangs on the side of this high-walled canyon and winds its way along tremendous precipices that sink sheer for hundreds of feet below. The road was originally constructed in the 1930s to support the development of dams along the Salt River. The trail is a day-trip from the Phoenix area and the ride is an experience you will never forget. You can avoid city traffic by approaching the trail via Saguaro Lake and Usery Pass. At the foot of the Superstition Mountain, the one that you are just about to conquer, you can get a glimpse of the old west by stopping at Goldfield Mining Town. This recreated ghost town was a booming gold mine over a hundred years ago. The Mammoth Mine produced about three million dollars in gold between 1892 and 1896. Tight switchbacks lead your way to Canyon Lake and Tortilla Flat. The name of the lake couldn't describe it any better. Steep canyon walls tower over the clear cool water with twisting ravines. Tortilla Flat is the only authentic stagecoach stop to survive the 1900s along the Apache Trail. A remnant of the old west, and still serving adventurous travelers of the mysterious Superstition Mountain area. The pavement ends eight miles from Tortilla Flat. Occasional sand patches colorize the packed dirt road that winds along the canyon and the Apache Lake, on the way to the Roosevelt Dam. A few miles south of the dam and along the shore, a short side road leads to the Tonto National Monument. The monument features two fascinating cliff dwellings built in the 14th century. It lies at the head of a lush side canyon with fine views of Roosevelt Lake. Along the way back to Phoenix there are the historic mining towns of Globe, Miami, and Superior. There were originally silver strikes here, but the principal ore has long been copper. The huge mountains of tailings are quite evident along the road. If you still have time and the desire to take another walk, visit the Boyce Thompson Arboretum, three miles west of Superior, one of the west's finest desert botanical gardens. You can finish the ride with an absolutely unique dining experience by stopping at the Organ Stop Pizza in Mesa. The restaurant was designed and built around a four-manual Wurlitzer organ, which was originally installed in the Denver Theatre in 1927. Note: Before you plan a ride on unpaved roads, make sure that your bike is equipped for such a ride and the bikers are prepared with the appropriate riding skills. This 210-mile loop requests a little sacrifice at the beginning but the rest is well worth it. You’ll leave the city on Interstate 10 which is not the ride you are dreaming about, however it is good for getting used to the bike if you rent one that you are not familiar with. The moment you turn off the Interstate at exit 103 you’ll find surprisingly little traffic on a gently winding road amidst the finest Arizona country landscapes. The curves get tighter as the road gradually climbs on the Vulture Mountains. As you’ll learn, everything in this area revolves around the vulture. You can find out why if you stop at the Vulture Mine, which is certainly located on the Vulture Mine Road, fourteen miles southeast from Wickenburg. Not entirely surprising that the ghost town you’ll see here is the remnant of the once upon a time city named: Vulture City. Rub the ore in the mine and you’ll see the glow of gold on your palm. Wickenburg is a good stop for an early lunch or for some refreshments before you venture beyond the pavement. It’s also a good idea to refuel your motorcycle. Don’t miss stopping at the Desert Caballeros Western Museum. If you want to stretch your legs, pick up a self-guided ‘Historical Walking Tour’ brochure at the Wickenburg Chamber of Commerce, right behind the old railway station and take a walk. It is another ten miles on the pavement to reach the Castle Hot Springs road, the core of this day’s adventure. This ride is only for well-experienced riders as the graded gravel road intermittently crosses and follows sandy creek bottoms. One stretch of road follows Castle Creek for 3 miles. The road is generally in good condition except after heavy rains and flash floods. As the name suggests this road leads to Castle Hot Springs, which is now only the ruins of the first (and one of the most beloved) spa resorts in Arizona. The compelling scenery of the Sonoran Desert is framed by the nearby low mountain foothills. An unexpected green oasis with abundant palm trees marks the place of the one-time luxury resort, which had achieved some fame at the turn of the century as a spa featuring the "magic waters of the Apaches." In its heyday, it hosted members of the Rockefeller, Vanderbilt, Ford, Theodore Roosevelt, and Astor families. After 28 miles of scenic dirt road riding, you’ll see the tarmac near Lake Pleasant Regional Park. You can access the north entrance from the Castle Hot Springs road. The park offers boating, fishing, swimming, hiking, picnicking, and wildlife viewing activities. At the Lake Pleasant Visitor Center, you can learn about the history of the area and desert wildlife. Step out onto the balcony surrounding the Visitor Center to get a beautiful view of Lake Pleasant and an up-close look at Waddell Dam. Return to the valley via Carefree Highway and take a little detour through Cave Creek and Carefree. Going into one of the community’s inviting western style restaurants will make your day complete.